This pair of beautiful antique windows have outlived the original frames And are now resplendent in an unfinished mahogany frame for shipping and display purposes. They were removed from a house in West Yorkshire during refurbishment. The glass has no chips or cracks and the leading is in excellent condition. This coloured glass is of a heavy and deep texture. A beautiful pair of windows to hang in a sunny place to brighten your day. Or to build permanently in to your home. Either way a sound investment. 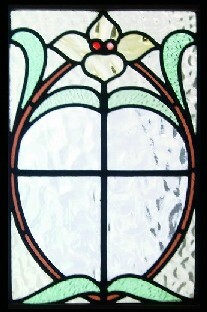 This Antique Window Shipped and packed to USA would be $159 fully insured. air freight. You can buy this now using the paypal link below the photograph or e-mail sales click here to arrange payment by personal check ,money order or bank transfer.